I have finally gotten settled in my new little nest of a house and I love it. It's a small room but it's cozy and i amazingly am able to fit everything into it! It took a while to get everything organized and settled but it's done now luckily. The rest of the house is really cute too. We have a living room, family room, dining room and a nice new kitchen. So far it's been really fun living there. I'm having a blast with my roommates! I'm living with Kirstine Moller and a couple of her friends Courtney and Lindsey. Nick is over lots since me and Kirstine live with each other which makes it really fun. Hopefully it stays that way! Only problems so far is our Box elder bug problem, but i think they'll slowly stop appearing once it gets colder.. but they used to be all over the place. I haven't found too many in my room lately, but when I first went there my nephew Gavin so kindly dubbed my house "the bug house." Hopefully the name leaves once the bugs do! 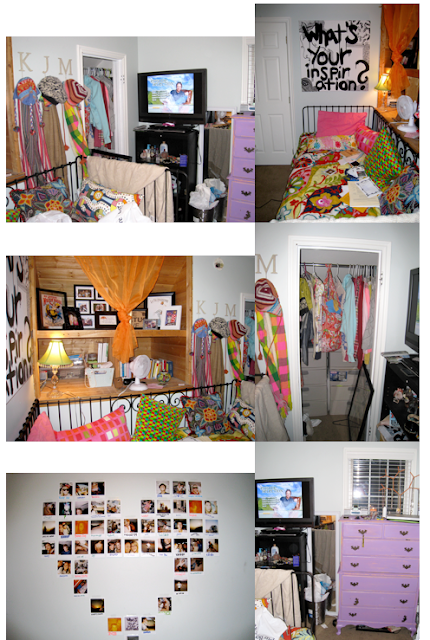 AWESOME room Kerry!! WOW - you have that "gift"...just like your Mom to take something and make "that something" extra special!! haha it is amazing you fit everything. i love it. it looks great. so colorful! i especially love the photo collage!